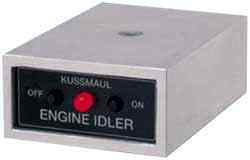 The Engine Idler Control is housed in a rugged aluminum enclosure, and designed for easy mounting. Two miniature pushbutton switches are provided on the front panel. One switch turns the output “ON” while the other turns it “OFF”. A single LED indicates that the control is in the high idle mode. Interlock inputs from the park neutral switch, or the brake pedal switch, lock out the high idle function, while the vehicle is moving. 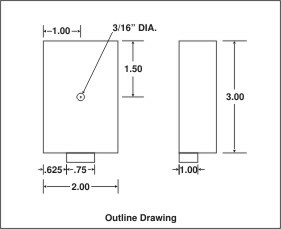 The output operates a solenoid valve, which may be used to control vacuum to an actuator, that advances the throttle. Alternatively, the output can operate a relay to couple this control to an electronic engine control. The Engine Idler Control is designed to be completely interchangeable with competitive devices.